What is another word for living? 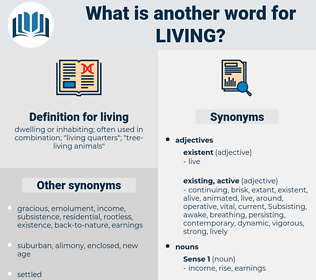 dwelling or inhabiting; often used in combination; " living quarters"; " tree- living animals"
Lives, lively, Life-saving, Evolving, rolling, non-living, life-long, vivo. Standards, settlements, Children, Births, Plants, Persons, assess, women. buildings, furnishings, ends, Necessities, rations, pursuits, routines, careers, places, Dreams, trails, PATHWAYS, ages, Arenas, avenues, streets, spheres, Habits, Paths, Diseases, routes, moments, Bees, 80S, choices, Lifestyles. Vis, challenges, GIS, Capita, livin, well-being, habitable, life-style, Staying, Habitability, life-span, vivo, life-form, Lifting, cohabitation. moved, Died, realized, Stayed, faced, fell, Were, found, ec, Risked, Happened, saw, Knew, Got, spotted, Meant, made, subsistence. surviving, 'living, lying, reviving, Receiving, leaving, Waiving, Removing, Inhabiting, driving, moving, evaluating, Populations, Achieving, coexisting, dying, Eliminating, settling, serving, compatriots, cooperation, Emigrating, preserving, Relying, rebuilding, remaining, Cohabiting, accelerating, Enjoying, provinces, Excluding, developing, Organizations, travelling, Sustaining, suffering, exercising, enduring, vibrating, government, identifying, withdrawing, Languishing, Establishing, Refugees, Migrating, Dispelling, immigrants, select, Having, losing, collecting, Providing, ending, struggling, Including, concluding, outlying, Agencies, sleeping, wandering, retaining, Physicians, increasing, leading, belonging, Addressing, equal, inuit, Medicines, enabling, dreaming, Areas, Maintaining, promising, continuing, facing, minimum, primary, Adjourning, dealing, Activities, rising, find, Witnessing, Placing, Undergoing, pretending, conducting, girls, exporting, becoming, growing, Assessing, coping, affecting, Occurring, attending, striking, schooling, strategy, changing, holding, coming, seeking, happening, seeing, looking, sharing, option, stressing, aids, bringing, contrasting, Debating, kicking, keeping, according, how, Creating, know, standing, boarding, taking, ensuring, moaning, saying, showing, youth, Forming, ranking, getting, 243, party, Doing, making, Children, Persons, women, Evolving, Residing, subsistence, Staying, rolling, Lifting. deprives, moves, Dies, supports, depends, leads, nourishes, stays, prevents, absorbs, exports, holds, Carries, brings, knows, robs, takes, places, S, puts, ranks, accounts, resides. live, livelihood, Residing, subsistence, lifestyle. live, life, Lives, livelihood, livelihoods, Residing, subsistence, Lifestyles, lifestyle. live, life, lifespan, livelihood, Residing, habitation, subsistence, lifestyle. dead, sluggish, apathetic, asleep, inactive, lethargic. incomparable, destroyed, lost, fading, relative, decommissioned, arrested, unalike, barren, ineffectual, phony, unusable, nonliving, nonoperative, sleepy, unworkable, dissimilar, wiped out, inoperable, dispirited, desert, nonoperational, nonfunctional, nonrealistic, nonoperating, ineffective, contrasting, quiescent, fake, nonnatural, inanimate, spiritless, nonproductive, exterminated, disparate, unnatural, unproductive, different, nonfunctioning, stillborn, useless, sham, finished, kaput, comparative, dull, lapsed, unmatched, ghostly, broken, ghostlike, terminated, unlike, deactivated, mock. So I am tired of living. I have spell'd thee, Lo, thy living smile once more! leaving, leaping, levy en masse, lepomis, lab bench, lapping, life mask, lapwing, living wage, lupinus, lebanese, lily pons, Law Of Moses, leafing, loafing, leavening, leibniz, loving, looping, liveness.